I am not impressed with Kristen Stewart, the face of Florabotanica Eau de Parfum ($125), but I am impressed with the fragrance. Regarding Stewart, I am unimpressed with her acting skills, unimpressed with her appearance (I don't understand why anyone finds her unusually attractive), and extremely unimpressed by her recent infidelity. I don't understand why she is amazingly popular. From my perspective, she has little going for her. Clearly, the ads for Florabotanica are aimed at a younger audience. Witness Kristen Stewart. She is not the "face" that would attract my generation. Fortunately, Florabotanica speaks for itself. The bottle is modern, but the fragrance isn't. It's a classic in the making. 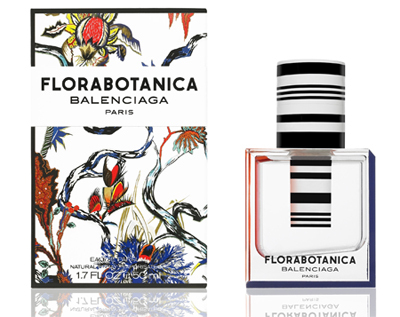 Balenciaga, in collaboration with Coty, Prestige, and International Flavors and Fragrances created this new fragrance that attracts attention with its modern, attractive flacon. It certainly got my attention at Neiman Marcus and jumped right onto my pre-sale list. It's beautiful. The scent was developed by perfumers of the well-known IFF. Olivier Polge and Jean-Christophe Hérault created it, using accords of vetiver, amber, and caladium leaf to create a resonance of mossy and mysterious dark wood. The rose, carnation, and mint accords add an exhilarating note of freshness. The unique rose is a hybrid, expressing the olfactory imagination of the two perfumers. How does that marketing blurb translate into reality? The fragrance is gorgeous. It's a powdery floral. Some "fragrance insiders" consider "powdery" bad. I don't. I like the softness and sensuality of Florabotanica. The unfortunate advertising campaign is decorated with three metal sculptures resembling a Ghesquière floral print. Photos for the campaign were taken by Steven Meisel. Stewart is wearing a dress from a floral collection and holding her hands in the pockets. Even the dress and the pose are wrong in my eyes. Why try to make Florabotanica something it's not? I'd recommend you stop to sniff next time you're shopping. Florabotanica is beautiful and has extraordinary longevity for a floral. I'm going to wear it to work today and see if it attracts any compliments. Florabotanica Eau de Parfum is available in 30, 50, and 100 ml bottles, as well perfumed body care products – body lotion and shower gel. I purchased the largest bottle. I'm going to be wearing it often. You can find it at Balenciaga's Web site, Neiman Marcus, and Bergdorf Goodman this month. Availability will expand in October to Nordstrom, Saks Fifth Avenue, and Bloomingdale’s. I love powderly florals too, Charlestongirl. I don't read "grandma" when I smell them I read "feminine". I really hate how younger women rate anything they don't like as "old woman". Really? I've recently discovered Love, Chloe which is also a powdery floral. Totally love it and not at all worried that I smell "old". The best thing to come out of getting older is the wisdom I've acquired. grinxdor, what a lovely comment. I am applauding. I've often read the "old woman" response to my beloved Chanel #5. CG, the fragrance sounds lovely, but I'll be passing. In regards to Kristen Stewart, it's not just her lack of acting skills, it's her apparent lack of gratitude and respect as she has been photographed countless times flipping the bird, including on the red carpet. Her emo teenage attitude creates an unfavorable impression to say the least. She does have a legion of rabid fans from her role in the Twilight movies, and I'm certain this is why Balenciaga chose her. I couldn't have said it better. Plus, I love Love Chloe too. As far as being grandma, I find that concept obsolete since baby boomers will take over the world - LOL. Whoa, whoa, whoa grlnxdor! Many of the women I see bandying the "old lady" smell are late thirties or better, at least if their online profiles aren't fibs. The fear of losing oneself and heading into the unknown is acute for some, I suppose, but I hate ageism. Luckily for these nasty ageists, unlike any other "-ism," the feared condition arrives for most of us. K-Stew, huh? Ick. I miss models, real models. I will try to remember to smell this the next time I float through Neiman's as I love a good floral. I left her behavior (except for the infidelity) out since I was being so harshly critical. However, now that you've brought it up, I find her immature at best and supremely arrogant at worst. I love a fragrance with powdery notes - I usually find everything way too sweet. 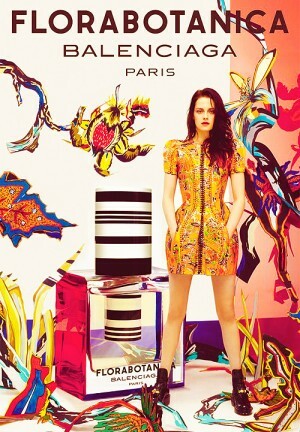 I am also disappointed with the choice of Kristen Stewart as the model for this fragrance. I agree with the commenters thoughts about her. She is so young (not so much her age but how she comports herself) and immature and infidelity is certainly not uncommon, especially in hollywood, but what I found especially egregious was the fact that she had an affair with a married man - yuck! She is certainly no role model for young women. It's funny, when I saw the fragrance I got excited and then saw the actress and my excitement dropped. I think I'll still try it though. Would have been nice to see perhaps Emily Watson or Natalie Portman as associated models or any other young and actually talented actress. Thanks, Jane! I miss models too. That whole movement toward use of celebrities (e.g., Katie Holmes is the new face of Bobbi Brown - Bobbi was a notable holdout, and now she has caved), celebrity worship, is so past its prime. That's totally right in my book, Nina! NOT a role model. I don't think this fragrance is too sweet. Give it a whiff. Just ignore the face and concentrate on the bottle. The box is pretty nice too. OMG I am so not impressed with K Stu either. Glad I'm not the only one! I think she's 0 for 7 here. I look forward to trying this sometime as I do love powdery frags. The bottle is a nightmare, though! Well its a good thing the fragrance is nothing like her acting skills. I was able to try the lotion and if the fragrance smells anything like its a must have for me and I can see myself wearing this often. Why don't you like the bottle?